Through a superior educational system, American labor out-skilled the rest of the world. The result was rising output and wages. President Donald Trump, in his usual distortion of reality, is not only claiming credit for the 4 percent GDP growth in the last quarter but is predicting this will become the norm. Not a chance. It has been four decades since the U.S. economy averaged sustained 4 percent real growth. The annual growth rate has progressively declined over this period to the current post-recession average of 2.1 percent. This is not enough to raise workers’ incomes. As a nation, we are not dealing with the cause of our growth problem, which is globalization in the form of a growing number of economies that combine technology with cheap labor and capital to take away markets and, hence, jobs from the U.S. economy. Especially hurt by globalization are the lower-skilled workers whose slow productivity growth no longer warrants the income increases available just a few decades ago. So far in this century (2000-2016), the median real family income is unchanged. This means no growth in the standard of living. At the same time, income inequality has increased, further intensifying anger among those suffering from income stagnation. It is these trends that explain the populist uprisings and the dogged support for Trump. In contrast, workers with skills appropriate for high-tech, high-growth industries are doing fine. But they account for only 13 percent of the U.S. workforce. It’s a shame because Bureau of Labor Statistics data show that these high-tech workers make 70 percent more than the average worker. If you are a politician, you want more high-tech jobs for your constituents. Policymakers have two basic ways to respond to globalization. One, championed by Trump, is to reduce taxes and shut out foreign competition through tariffs. It is admittedly an easy policy response to implement. In the stroke of a pen, tariffs can be imposed on imports. 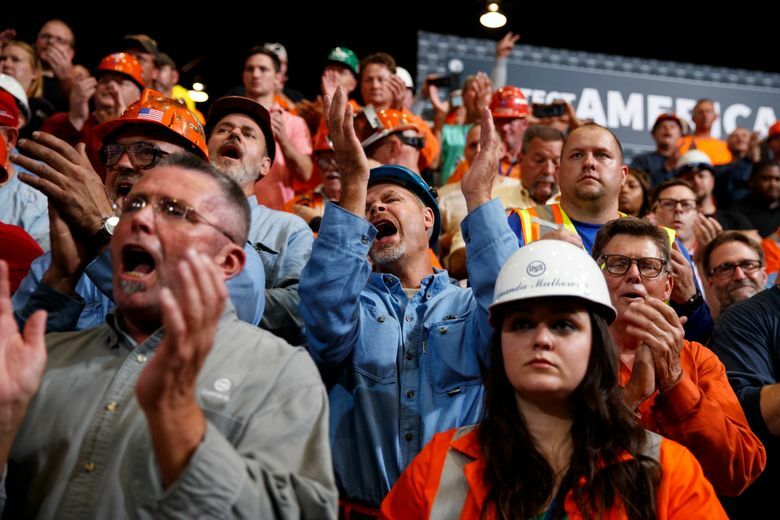 A Pew Research Center poll shows 73 percent of Republicans support tariffs. Yet, tariffs are guaranteed to reduce real incomes for most Americans. Protection of inefficient industries raises prices and thus lowers total purchasing power — and invites retaliation. The result is a decline in the standard of living. On the other hand, the real long-term economic solution — increasing productivity and hence competitiveness in global markets — takes time and considerable investment. Higher productivity allows more to be produced for less. The lower labor content per unit of output — the argument many use against automation and other productivity enhancements — is more than compensated for by resulting larger shares of global markets, which increased demand for workers. Companies pay for productivity, so not only do sales and jobs go up, but so do wages. American politicians have instead resorted to quick fixes, such as last year’s tax cuts, which can work as a business cycle stimulation device — but not as a long-term growth tool. Corporations are using much of the income tax cuts to buy back shares of stock, which rewards stock holders through higher share prices but does nothing to increase their productivity. In fact, income-tax cuts can actually reduce incentives to invest in greater efficiency. Ironically, the Democrats in the middle of the last century embraced investment in technology and education as the drivers of productivity. The slogan of the 1992 Clinton presidential campaign was, “It’s the economy, stupid.” This focus led to victory, but the follow-through was brief. In the 2000s, corporate investment dropped precipitously, and government support for R & D that produces the technology to drive productivity growth continued a long-term decline as a share of GDP. Today, the Democrats’ economic doctrine is largely relegated to income redistribution through such initiatives as higher minimum wages, single-payer health care and free college tuition. While just as appealing to the left as the Republican income tax cuts and trade bashing are to the right, neither is a true economic growth policy. The U.S. once had the right growth strategy. Government funded the early phases of new technology development, which spawned virtually every major technology driving the U.S. economy in the post-World War II era. Through a superior educational system, American labor outskilled the rest of the world. The result was rising output and wages. A public-private investment strategy to increase productivity has become the mantra for economies around the world. Ninety-five percent of the world’s consumers live outside the United States, so exports are where the battle is being fought, and we are not winning. Gregory Tassey is a research fellow at the Economic Policy Research Center, University of Washington.